Muscle growth requires tension. If you haven’t been gaining muscle, one likely culprit is a lack of high-threshold motor unit recruitment during your sets. When the tension of your muscle contractions is too low, you’re not stimulating the muscle fibers that have the most growth potential. This holds true for any muscle group. However, the calves come to mind here since they’re one of the most notoriously stubborn muscle groups – if you chose the wrong parents. In Arnold Schwarzenegger’s Encyclopedia of Bodybuilding he mentioned that one of the ways he got his proportionally puny calves to grow was with super-heavy sets of incline leg press calf raises. In essence, he forced his calves to produce more tension and they grew because of it. But you’ll quickly run into a wall of fatigue and joint strain if you only add weight to your exercises. There’s a simpler, safer and more effective way to get more tension and growth out of your sets: the squeeze. Let’s say your biceps are lacking size. If I hooked up your biceps to EMG electrodes and had you perform a heavy biceps curl or weighted pull-up you’d see some impressive electrical activity on the screen. Now, what if I just told you to just squeeze your biceps as hard as possible without any weight in hand? What would the EMG show? A helluva lot of muscle activation, maybe even higher than you achieved while doing curls or pull-ups! I can say this because I’ve performed that exact experiment on myself. 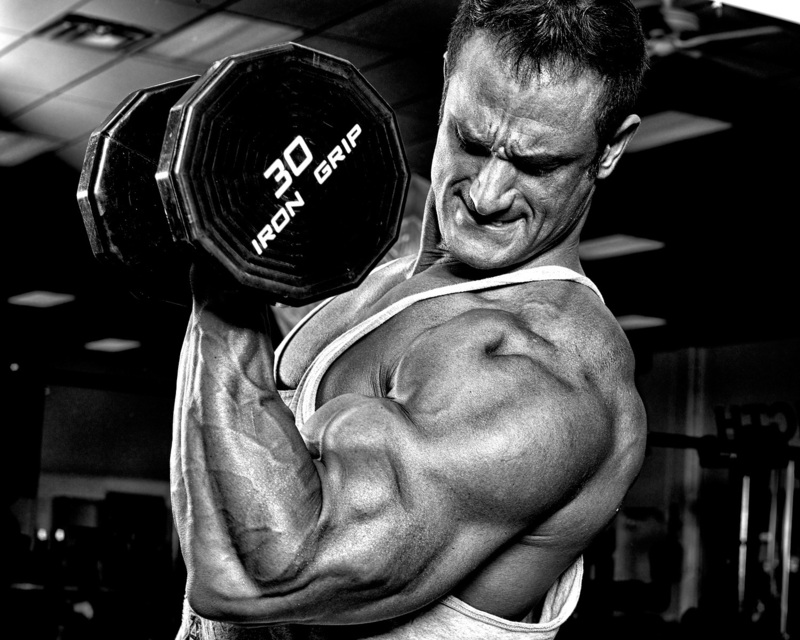 Professional bodybuilders understand the muscle-building power of an intense squeeze. Indeed, you’d be hard-pressed to find an interview where one of the top guys doesn’t mention it. The trick is to find the right balance between the weight you’re lifting (it shouldn’t be too heavy) and the amount of time you squeeze a muscle at its peak contraction. Unfortunately for us, the National Institute of Health (NIH) doesn’t consider this information a priority, so I was left to figure it out through my own experimentation with clients. How to do it: Stand on your right leg without shoes, and perform one calf raise as high as possible and squeeze the peak contraction as hard as you can for 5 seconds. Without resting, perform 5 full calf raises with your right calf. At the top of the 5th rep, squeeze the peak contraction for 4 seconds followed by 4 reps. Then squeeze for 3 seconds followed by 3 reps. Continue with the sequence until you squeeze for 1 second followed by 1 rep. Do the same with the left calf. Perform 3 sets with each calf. How to do it: Hook both heels under the pads of a horizontal back extension stand. Pull the left leg out so only the right heel is against the pad. Perform one single-leg back extension as high as possible and squeeze the peak contraction as hard as you can for 5 seconds. Without resting, perform 5 full single-leg back extensions with your right leg. At the top of the 5th rep, squeeze the peak contraction for 4 seconds followed by 4 reps. Then squeeze for 3 seconds followed by 3 reps. Continue with the sequence until you squeeze for 1 second followed by 1 rep. Do the same with the left leg. Perform 3 sets with each leg. How to do it: Perform one single-leg hip thrust as high as possible and squeeze the peak contraction as hard as you can for 5 seconds. Without resting, perform 5 full single-leg hip thrusts with your right leg. At the top of the 5th rep, squeeze the peak contraction for 4 seconds followed by 4 reps. Then squeeze for 3 seconds followed by 3 reps. Continue with the sequence until you squeeze for 1 second followed by 1 rep. Do the same with the left leg. How to do it: From the top position of a push-up, try to pull your hands together as hard as you can for 5 seconds (your hands won’t move but you’ll feel your chest contract intensely). Without resting, perform 5 full push-ups. At the top of the 5th rep, try to squeeze your hands together for 4 seconds followed by 4 reps. Then squeeze for 3 seconds followed by 3 reps. Continue with the sequence until you squeeze for 1 second followed by 1 rep.
How to do it: Row your body to top position, then squeeze your biceps as hard as you can for 5 seconds. Without resting, perform 5 full inverted rows with your palms up. At the top of the 5th rep, squeeze your biceps for 4 seconds followed by 4 reps. Then squeeze for 3 seconds followed by 3 reps. Continue with the sequence until you squeeze for 1 second followed by 1 rep.
You probably noticed that none of the aforementioned exercises require anything other than your body weight. However, they’re incredibly effective for building muscle without overloading your joints with massive weights. For this week only, you can get the complete system for 10% off at checkout, just put in the coupon code SAVE10. Hi Chad, do you not recommend taking a 10 sec break between each ISO squeeze and the reps that follow, as you recommend in HFT2? CW: Yes, that break is specific to the HFT2 program. I can’t give away all the details for free! Does this type of training create much higher demands on recovery? CW: Sure, it will tap into your recovery capacity. That’s why it’s important to start slow and build from there, as outlined in the full HFT2 program. Hi Chad, it is a greath article, thank you. Is it convenient to stretch the calves between series or not (same question for general muscle too)? Can stretching during rest time damage fibers or null the squeeze benefits? What kind of resting between series do you recommend? CW: I don’t recommend stretching between sets because it will temporarily limit your ability to recruit the high-threshold motor units. Save stretching unitl the end of the workout. Thanks for the article. Are these count down sets meant to replace your entire workout (used for each body part or movement in a workout), to be used for one or two body parts or movements on top of your regular workout, or done in a separate workout from your regular training? First off I want to start off by saying how awesome HFT 2 is! My question is what do you recommend to someone who has completed HFT 2 with great results. Should I simply restart it? If so do I need to increase the volume/loads or stick to the same parameters? CW: Restart it and hold the peak contraction of each rep longer than you did the first time around. The other options are to add weight or do a more challenging version of the exercises. I always look forward to your articles. Based on what you outlined in this article, what do you recommend for tris and quads? Great insight and relative routine…I was inquiring to see if you had a recommended substitution for the single leg back extension? If one does not have access to horizontal or any back extension station? At home or with just rack, weights, pull-up, dip bars, and bodyweight? CW: Rest your torso on a stability ball (Swiss ball), and hook your heels under a secure structure 12-18″ off the ground. I was really impressed by the results I got with the V2 program in HFT2, especially for the upper body and core (less for the quads, I have to say) and the exercices are great, I added some of them into my routines and made friends try them and now they like them. To follow the question of Alex (1st one) but without giving too many details ( 😉 ), the 10 secs should be only used in TT program and not in V2 (or V1), right ? Thank you very much Chad. CW: The 10-second rest can be used anywhere between the squeeze/rep sets, depending on the endurance capabilities of that muscle. In other words, if you fatigue quickly without the rest, use the 10-second rest period and shorten the rest duration to 8/6/4/2 seconds over the course of weeks to stimulate hypertrophy. Thanks, Chad, for another great article! Would it make much difference if I tried this variation? 4 reps, followed by 4 seconds…. Or maybe you’ve found that starting with the one rep and then squeezing for 5 seconds works better? CW: Starting the set with the squeeze works better for high-threshold motor unit recruitment since you’re not fatigued. i am a big believer in your high frequency approach to training. I got great results from HFT 1 and 2, but got my very best results from your program published years back called “Next Frontier”. Notably, weeks 1+ 2 gave me astounding gains and recovery. So I have been running a routine alternating those weeks alone with a deload every 8th week. My question is…”do you have any suggestions regarding new exercises, progressions, or programming alterations”? Any help would be much appreciated. Thanks much. CW: The parameters I outline in HFT 1 and 2 work best. I’ll be discussing other variations in the near future. Stay tuned.